This month: a simple strategy for dealing with papers without names and a fun way to identify which students have completed an important assignment… and which ones haven't. For as long as students have been completing assignments, there have always been those few individuals who, for whatever reasons, neglect to put their names on their papers. All right. 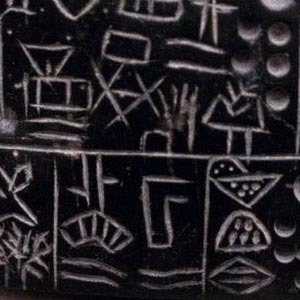 Who didn’t cuneiform his name on this clay tablet? If history is any indication of future behavior, then I think you’re going to have to accept the fact that you will not be able to change this phenomenon. The best you can do is to deal with it as simply as possible. No, the cards are stacked against you if you attempt to gain the attention of the negligent student with just your words. On the other hand, you will have four or five neurotic overachievers—who do hang on your every word—rushing toward you to see if it happens to be their paper you’re holding aloft. That’s always fun. Eventually you’ll get to the point whereby you can recognize just about everyone’s handwriting. Nonetheless, the massive number of the assignments you’ll be collecting and processing throughout the school year requires that you develop some kind of simple procedure for handling the unidentifiable ones. Get your hands on a large, see-through plastic container of some type. (Many snacks sold in bulk sizes—100-200 items—come in these kinds of containers.) Place the container in a visible, easy-to-get-to location. Announce to your students that, henceforth, all papers that do not contain some form of identification will be placed in the Return to Sender container. After that, it’s merely a matter of training the students to use it. Either they’re dropping a no-name paper into the container—because they were collating a stack of assignments for you and found an assignment or two without a name—or they’re checking it to see if the container is holding one of their own missing assignments. Teacher Tip: A teacher told me that she has a special spot on one of her bulletin boards where she posts papers with no names. Before she pins the paper to the board, though, she writes the name “Waldo” on it. Since there were no students in class named Waldo, everyone got the message that there were assignments waiting to be claimed and named. 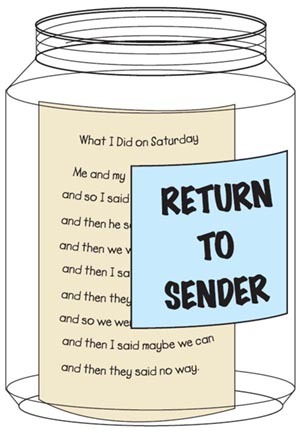 I think I actually like this idea a bit better than my original Return to Sender procedure. The advantage of using a bulletin board to display the papers is that they’ll be much more visible than if the papers were placed in the container. This increase in visibility will heighten everyone’s awareness of the no-name-on-the-assignment situation and result in fewer assignments going unclaimed.